At one of the auctions held by Sotheby’s in Hong Kong, a 500-year old Ming Dynasty vase was sold for $21.6 million. The vase was a Blue and White Porcelain Imperial Vase, which became (at that time), the most expensive vase in popular Ming blue and white style ever sold. But why is it that Chinese porcelain, particularly those created in ancient times, so valuable and very much sought after? There are two reasons for this. One is the fact that China is the country responsible for the invention and eventual manufacture of fine porcelain. Outside of China, porcelain is often called “fine china” or simply “china.” The second reason is because the quality of porcelain that came from China was of the finest quality compared to those created in Europe. An Arab merchant who visited China in 851 AD, when the country was under the Tang Dynasty, remarked that he had seen vases that were almost like glass in their transparency but were actually made of fine clay. Porcelain, having been invented by the Chinese, is a very important symbol of the country’s ancient civilization and the town of Jingdezhen, which is known as the ceramic capital, has a very long ceramic-making history, which started during the Han Dynasty. It was previously named Xinping but during the Jing De Reign of the Song Dynasty in 1004, it was ordered that porcelain wares for the imperial court must have a mark at the bottom that said “Made during the Jing De Reign” that led to the city being renamed as Jingdezhen. All the royal porcelain were manufactured in the city where the royal kiln was built. Among the classic decorations, the color glaze, the rice pattern, famille rose, and blue and white were the most famous. Famous scholar and historian Guo Moruo described the porcelain made in Jingdezhen as such: bright like a mirror, sound like a bell, paper-thin and white as jade. While there was confusion as to what makes porcelain in the past, evidence gathered by archaeologists contend that the very first item to be called true porcelain was from the Zhenjiang province, during the time of the art development during the late Han Dynasty. Kiln sites from the Eastern Han revealed that firing temperature ranged from 1,260 to 1,300 degrees, which indicated that those were the temperatures used for making porcelain. It also meant that the ceramic artists of China created porcelain items 1,700 years ahead of their European counterparts. Chinese porcelain is one of the best examples of traditional art in China, aside from calligraphy, jade carving and brush paintings. Porcelain is made from kaolinite clay, mixed with petunse, a pottery stone, quartz and feldspar. It could also include alabaster, stealite, glass, bone ash and ball clay. The type of clay used for porcelain is shorter and lower in plasticity compared to clays used for other pottery items. Likewise, the clay that comes from the north of the country is vastly different from the ones from the south. Typically heated at very high temperatures, this method causes the formation of glass and combined with other chemical ingredients, porcelain is thus rendered with translucence, strength and toughness. Based on records, ceramics in China were first made during the Han Dynasty (206 BC- 220 AD) and continued through the short-lived Jin Dynasty and Sui Dynasty from 221 AD to 618 AD, and through the Tang, Song and Yuan Dynasties, covering the period from 618 AD to 1368 AD. The height of ceramic art in China was reached during the Ming Dynasty (1368 AD – 1664 AD), when the now very famous blue and white porcelain, which was still manufactured in Jingdezhen, started to be more refined in quality and artistry. Cobalt blue porcelain had been made since the 9th century in the province of Henan, but it was during the 14th century that the finest and most translucent of blue and white porcelain were produced in the town of Jingdezhen. It was during the Ming Dynasty that manganese was added to cobalt blue oxide to prevent it from bleeding during firing, which highlighted and brightened the design created for the items. These were the Ming ceramics that reached Europe around 1603, courtesy of some Dutch traders that seized the cargo from Portuguese ships. It created a huge demand in affluent Europe that was seeking for unique and rare items to collect. 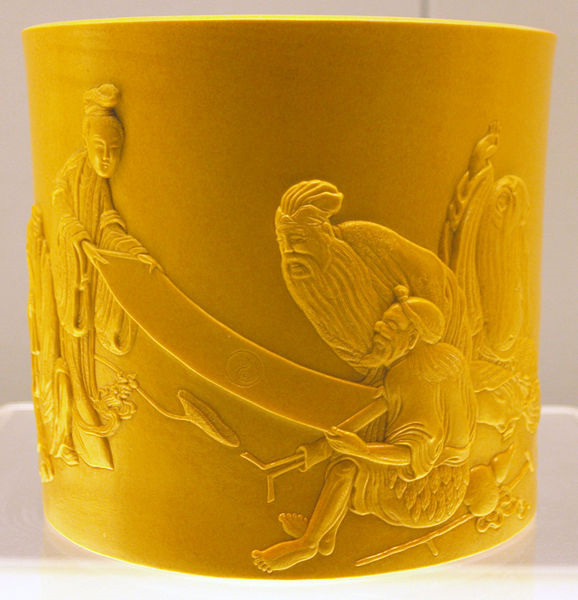 And while ceramics manufacturers in Europe tried to replicate the process, they failed in duplicating the artistry and methods used by the Chinese ceramic artisans. Production of the blue and white porcelain, considered China’s “white gold” reached its peak during the reign of Emperor Kangxi (Qing Dynasty) around the middle of the 17th century and early part of the 18th century. Jingdezhen ceramics was the epitome when it comes to porcelain production in terms of variety, design, quality and quantity, which reached its peak during the Ming Dynasty. Still Chinese porcelain is not only confined to blue and white. Artisans from Jingdezhen also invented the porcelain with red underglaze, which is very rare due to the difficulty in its production. They were also able to produce porcelain with blue, copper red, three-color, yellow and green glaze. A small Red Porcelain Bowl decorated with two lotus flowers and made during the time of Emperor Kangxi, was sold during an auction by Sotheby’s for $9.5 million.